Harry Wilson scores yet another superb free-kick to give Wales victory over the Republic of Ireland in the Nations League. Ryan Giggs' compared Harry Wilson's free-kick expertise to former Manchester United team-mate David Beckham after he scored the winner in Wales' win over Republic of Ireland. Wilson, who is on loan at Derby from Liverpool, struck from a set-piece in the 58th minute to secure victory for Wales in the UEFA Nations League clash. He also netted from a free-kick last month as Derby won at Manchester United in the Carabao Cup. "It's a special talent to be able to do that," said Wales manager Giggs. "He does it all the time in the training. I have seen David Beckham over the years with his free-kicks and it's all about practice, practice, practice, and Harry does that as well." 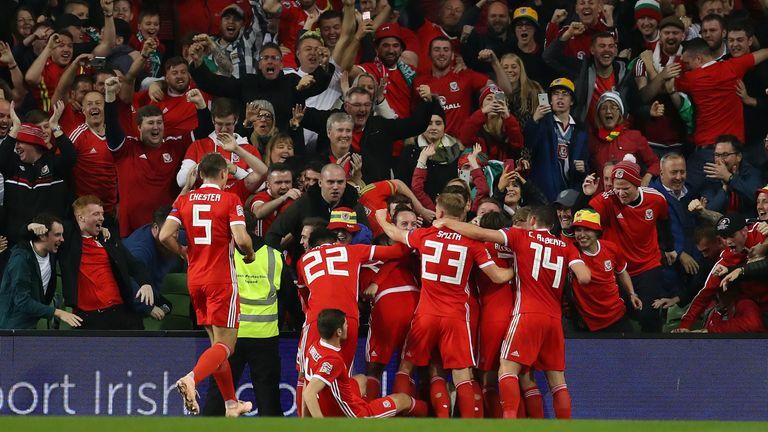 The victory means Wales will be seeded in Pot Two for Euro 2020 qualifying and will now battle for top spot in Group B4 with Denmark. "I'm so proud," said Giggs, who was without Gareth Bale and Aaron Ramsey for the match. "It's not easy when you miss players of that quality but the players who stepped in were brilliant. Even the substitutes coming off the bench, everybody contributed. This team when they are down they come back and we showed real character and spirit. "They dug in right to the end. It was a really brilliant second-half performance. The first half wasn't great but we made up for it in the second half. "I said about Thursday against Spain we didn't do the basics, and tonight we did - defending, not giving any chances away, we were a much smaller team but the determination to win the set-pieces was amazing." Giggs also picked out Ashley Williams for special praise, saying: "It was led by the captain. I said I wasn't happy with the first half and I don't want to just pick out one name but Ashley Williams was outstanding for 90 minutes. "It was a real captain's performance. He defended and did all the hard stuff, which then gave us the platform for the chances at the end."